Researching the historical roots of any Holiday practice usually produces interesting findings! That's what happened to me while reading about Valentine's Day. The excerpt below was taken from a wonderful book, "Saints Preserve Us" by Sean Kelly and Rosemary Rogers. Enjoy your Valentine's Day! "The martyrdoms of three different Saints named Valentine are celebrated on this day; in various Roman churches eight complete bodies (and one head) of Valentine are venerated. One of these a priest and/or physician beheaded in 269, is traditionally invoked against blindness and epilepsy. The association of this date with courtship may arise from the mid-February pagan fertility feast of Lupercalia, and/or from the medieval belief that birds chose their mates on this day. 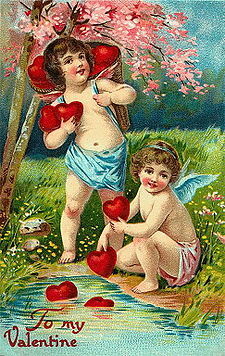 "Valentines" were originally cards that boys drew by lot, inscribed with names of girls to be courted. An attempt to improve this custom by substituting the names of Saints to be emulated was once made, without much success, by Saint Francis de Sales." Valentine graphic from Creative Commons.